This narrow headband is part of the traditional costume of young girls and not married young women in the Tana Toraja region of the southern part of the Indonesian island of Sulawesi. It is worn only for special occasions (such as weddings and village festivities) together with colorful long dresses and a mandatory Chris, a curved dagger on the belt. 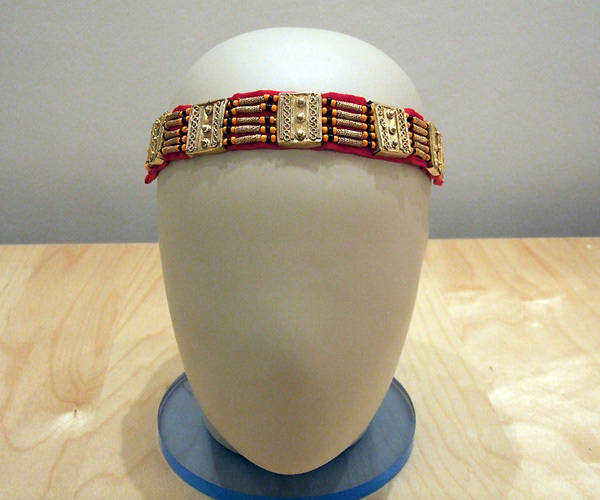 The basis of the headband is red silk fabric adorned with rectangular brass plates, copper wire and beads. It is tied behind with a usual braid.